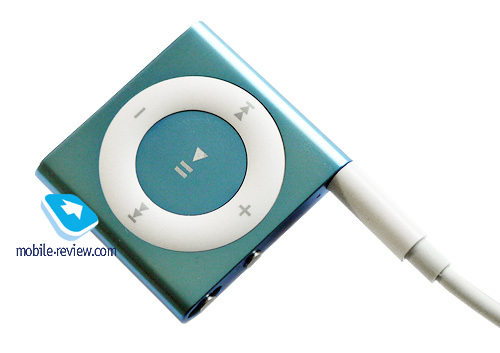 I am not sure about the generation number of iPod Shuffle. It must be version No 4. There was a transitional variant with new colors and prices as well. So, we have generation 3.5 or something similar. It is not important anyway. I would like to start with describing the origin of Shuffle. I will blink away a nostalgic tear as the first Shuffle review was written in 2005 by Sasha Dembovsky and the player was gratefully provided by "McCentre". Those were the days. Second generation player was reviewed in 2006 with the third one followed in 2009. It was in March and the weather was terrible. The player left positive impressions though. I will stir it up the way Apple did it. 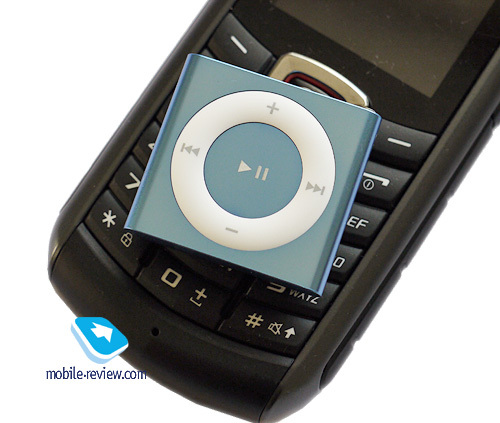 It looks like a 2nd generation Shuffle, but is way smaller. Compare the old one at 27.2 х 41.1 х 10.4 mm, weight – 15.6 g with the new taller and narrower version at 29 х 31.6 х 8.7 mm, weight – 12.5 g. It is interesting to look at the model in comparison with the current Shuffle. 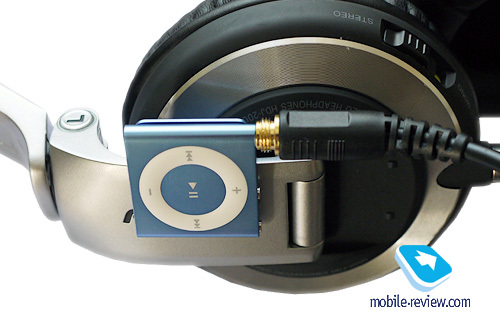 Anyway I prefer the metal bar with the headset in the box, while new Shuffle has simple headphones instead. Do you also find it strange? Everybody knows when new Apple toys are launched the old ones fade away. This year new devices just expanded the range. Also take into account that all players have different versions in terms of colors and memory. The move is definitely interesting. Плеер сделан из железа, на задней части тугая прищепка, над ней вы можете видеть обозначения основных функций для элементов управления. Они, соответственно, на торце - кнопка включения, щелчок, переход в режим воспроизведения по порядку, щелчок, режим Shuffle. То бишь, перемешивание. Рядом - кнопка активации VoiceOver, в обзоре Shuffle третьего поколения я довольно подробно про это дело рассказываю. Выше есть ссылка. The player is made of metal and the back features a tight clip with symbols of main controls features. 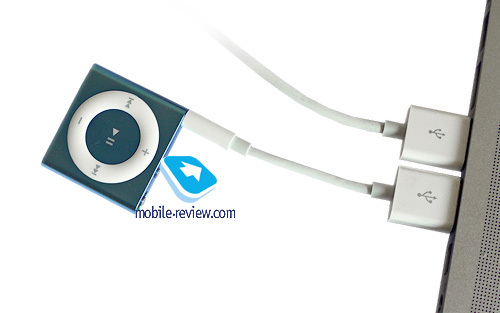 On top they are switch on button, click, move to playback in order and a Shuffle mode. 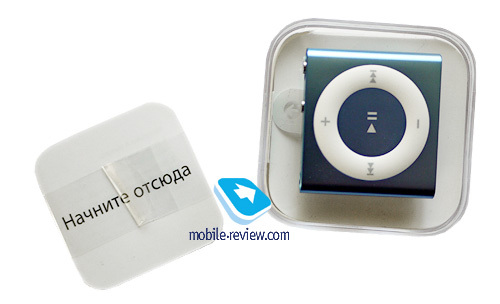 Near we see a VoiceOver activation button, which I have described in detail in the review of 3rd generation Shuffle. See the link above. The front boasts a joystick typical of 2nd generation Shuffle. There are no sensors – only hardware buttons – volume control, rewind and Play/Pause. 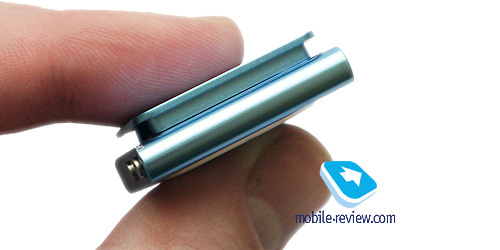 There is obviously a 3.5 mm jack for headphones. Close to it you can see a tiny light indicator. All in all they took an old, but good horse, gave it a performance enhancing drug, colored it, downsized and sent away running. There are five colors – pale green, pink, blue, grey and orange. I tested a blue one. ОК, светло-синий. Голубенький и красивенький. 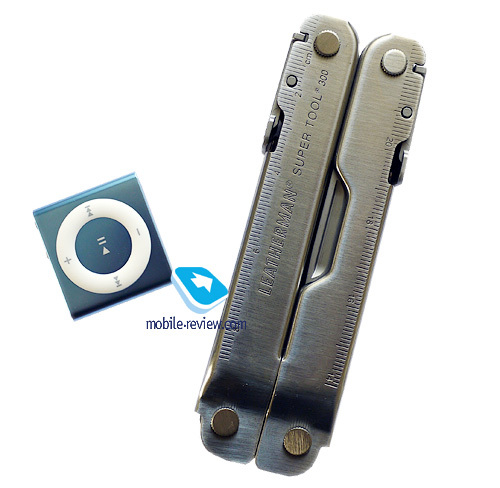 I think you know that Shuffle is not the most popular Apple player, but it has its niche. Some like it simple and reliable. If you hit it against the ground nothing will be broken. And you still get an Apple. 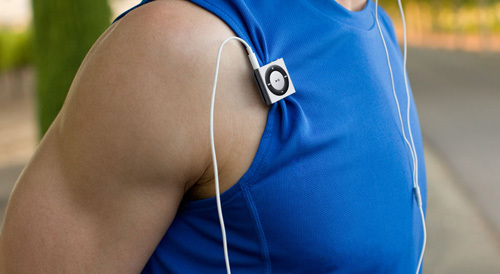 One of official pictures clearly shows how to use Shuffle. I look at this picture and start crying. When I was 25 I had similar arms and didn't boast a fat belly. It's not too little too late, but there are some questions already. Dear friends, take care of your health. Stop smoking, go to the gym and enjoy yourself. 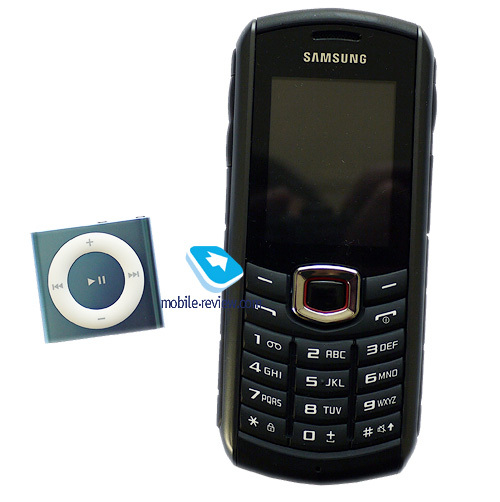 You get only 2 GB models and apart from music some files can be recorded as well. 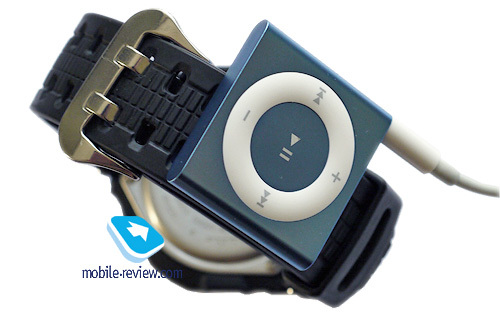 The manufacturer claims up to 15 hours of music playback and the fast charging is supported too. 2 hours are enough for 80%, while the full charge via USB takes 3 hours. In Windows you have to download iTunes, bear it in mind. There is no software CD in the box as it is too small for that. Long ago all customers in Russia received a CD with iTunes. The cable in the box is so precious, that you'd better never lose it as it will be difficult to find a replacement. The box is really minute and I especially enjoy tiny logos with text "Start here". As to the advantages I have already mentioned the possibility to use any headphones, which is a step forward from the previous generation. 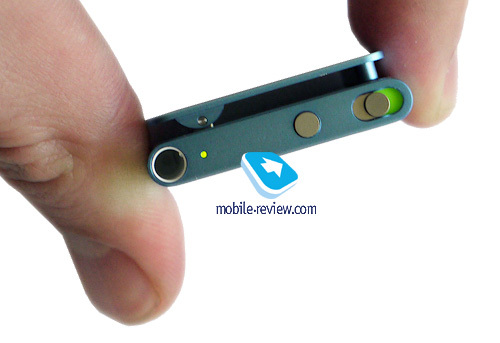 It has controls on the body, VoiceOver, famous design, colors, etc. 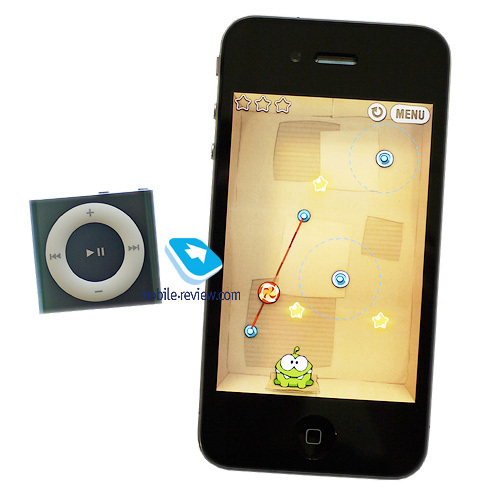 It costs around $80 and many customers will prefer a player with the display, many formats support and so on. 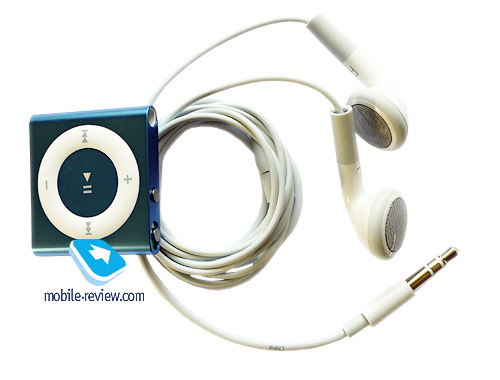 iPod Shuffle of the current 4th generation remains a niche model for those who want to familiarize with Apple products or look for a durable player for running and other sports.